I think it was meant to be that I read Dog Crazy while we were moving into our new place. You see, the main reason we moved is to get a dog. I think it's a shame that it's quite difficult to find apartments that are dog friendly. Well, we finally did! Also, I can’t resist any book with puppies on the cover. We had to put down Shaina, my mom’s dog (I felt like she was mine) last October. I’ve never experienced such heartache and grief before. This being said, I can 100% relate to how Maggie’s patients (and herself) felt. Dogs become part of the family, so losing one is just like losing a family member. Maggie truly cared about her patients and really helped them overcome their sadness. However, it seems a little strange that she was a therapist but had a heavy issue of her own to deal with. As the story moved on though, I was rooting for Maggie to overcome her own demons, along with helping Anya find her dog, while everyone else felt that wasn’t possible. Of course I also enjoyed the romance that developed between Maggie and her love interest. 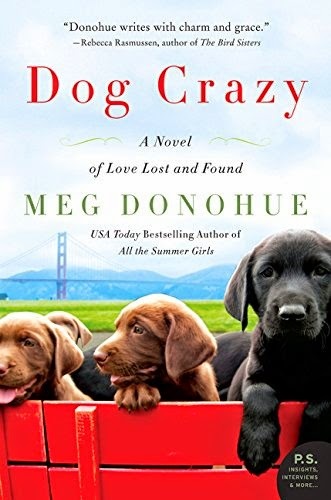 Whether or not you are a dog lover, if you are interested in a light and quick read, then you should definitely get yourself a copy of Dog Crazy. Great review. This sounds like a really good book.